This has to be one of, if not the, most confusing Derbys in memory, as we have to deal with a whole new cast of characters than the one we started with last fall. The one-two finishers of the Breeders’ Cup Juvenile are gone, the one-two finishers of the Champagne are gone, the one-two finishers of the Remsen are gone, as are the winners of the CashCall Futurity, Frontrunner Stakes, and that includes early Derby favorites Cairo Prince and Honor Code, as well as Top Billing and most recently Hoppertunity. But that is in the past. We have to deal with what we do have and attempt to sort out this puzzle. I have been touting California Chrome since January as having the potential to be something special, and have had him ranked No. 1 for quite a while. While I still feel that way, I had been hoping to see him at Churchill Downs earlier, to get used to the surface and most of all the new and unique surroundings. After watching him school in the paddock at 7 a.m. with no one around instead of in the afternoon between races, and watching him looking around in his gallops, I feel even stronger about him coming early. By drawing post 5, with speed directly inside and outside of him, he has to break sharply but can’t get caught up in a fast, contentious pace, and can’t get distracted or become affected by all the noise and people. He does get a bit antsy at times in the paddock, and that is with no distractions in the quiet of the morning. But he’s certainly not difficult by any means, just some nervous energy, and it’s just a matter of how he handles everything. With that said, it would be foolish for me to go off him now, even though he’s not quite as laid back as I thought watching him race and work. I still feel he’s one of the most gifted young horses I’ve seen in a while, but this is the Kentucky Derby, where gifted does not always apply. It’s more about getting lucky and being professional and putting together that one perfect performance on the right day. So, while I still rank him as my No. 1 3-year-old and one of the most talented horses in the country, from a betting standpoint, I look for value, and he will be a prohibitive favorite. Also, a good part of this column is to concentrate on horses I’ve seen train on a daily basis over an extended period of time and how they work over the track. Often, it will take two works to get a proper line on a horse. It’s very difficult with no works and only two or three days of gallops. And we don’t know how he will take getting dirt kicked in his face. He has been beaten when encountering traffic in the past. I feel there are several live longshots in the race based on how they’ve been working, training in general, acting, and looking physically. 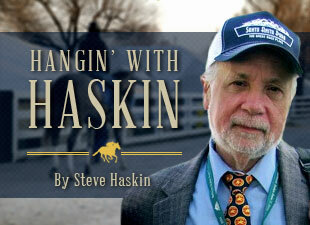 One horse who has generated some buzz is Medal Count, based on his training and trainer Dale Romans' extreme optimism. Physically, he does not look like your typical Derby horse, being more on the blockier side, but he handles this track as well as anyone, and his work and gallops have been consistently powerful. The Derby will be his third start in 29 days, and you have to wonder if can take a big step forward off his second in the Blue Grass. He along with Intense Holiday are the only two horses to have run a negative number on Thoro-Graph, and Trakus puts him several lengths better than his Blue Grass conqueror Dance With Fate, based on having run 31 feet farther after going very wide on the first turn. I can’t go heavy on Dance With Fate, despite his strong gallop May 1 and overall appearance, because I haven’t seen much of him. But I was extremely impressed with the ease of his final work in California, where it looked like he was in a common gallop, yet still went in :47. So, because of the nature of this column I would look heavily at Medal Count as a longshot to hit the board and possibly win it all. Another longshot I will play is the most forgotten horse in the field, and that is Candy Boy. He was dead short in the Santa Anita Derby, was forced to race closer to the pace because of the speed-favoring track, and has a lot of room for improvement. On top of that, he came here early to have a work over the track, and though it was not discussed much, it was a very powerful work. He is the first Derby horse on the track each morning, along with either General a Rod or Vicar’s in Trouble, so most people have not seen how strong and consistent his gallops have been, especially the one May 1. He is a robust and powerfully built individual who can take any bumping he may incur, and he’s one of the few horses in the field you can say for sure will get the mile and a quarter. Medal Count is another, despite his blocky physique, which makes both these colts longshot specials. I would include General a Rod in this category if I knew how the public is going to play him. The feeling here is that he may be ignored, but he is another I’ve been following closely, just waiting for him to revert back to the General a Rod I saw break his maiden at Keeneland last year. Mike Maker has tinkered with his blinkers and I expect him to be much farther back than he was at Gulfstream, where he was forced to use his early speed. His pedigree, especially his strong female family, will get him the mile and a quarter with little problem, even with the presence of Meadowlake, who is more of a miler influence. Sticking with longshots, and we’re talking about horses in the 20-1 range, it would not be surprising to see Ride On Curlin run a big race, despite the bad reviews he received in his last work. I was not among his detractors and saw things in his work that I liked, especially the distance of the work (seven furlongs) over a deep, loose racetrack that was tiring and playing very slow. The farther you worked over it the more demanding it became, and he did go from the quarter-pole to the wire in :24 2/5 and then kicked in another gear. His final eighth was :13, but part of that was on the turn, so I believe he got more out of this work than people think. He’s not the type of horse who glides over the track, so he doesn’t look as pleasing to the eye as some of the others. But he still gets the job done, and he has now reverted back to his come-from-behind days and should be closing. So, there are some longshots to play around with. Even a horse like Uncle Sigh has the potential to run big at a huge price, but you just don’t know how the addition of blinkers will affect him. We all remember Palace Malice last year. Major equipment changes can be very tricky in the Kentucky Derby. But he did work beautifully in them at Belmont, and he looks the part physically, so we’ll see. He is more of a guess or gut feeling type of horse. Now for the lower-priced horses. And I have to say right off the bat that the Todd Pletcher pair of Intense Holiday and Danza will be on all my tickets, based on how they’ve been looking and training. Danza is extremely intriguing as a potential freaky type of horse; he looked so amazing in the Arkansas Derby. You have to decide whether it was a fluke or if he is a superstar in the making. He is drop-dead gorgeous, and I just love the way he begins his gallops every morning by casually turning around and then taking off in a flash and immediately breaking off into a strong open gallop. He means business and has a great deal of class about him, and it bodes well for the Arkansas Derby being a legitimate race. His pedigree shouts miler, and coming back at 1 1/4 miles in three weeks could be tricky, but his raw talent may trump his speed influences. The truth is, we really have no idea what we’re dealing with. As for Intense Holiday, he wins the award as the best worker and galloper on a consistent basis. He made We Miss Artie look so bad working in company it prompted Pletcher to try to convince owner Ken Ramsey to withdraw We Miss Artie. Each day he gallops down on the inside and moves over this track so fluidly and with such authority, you know at least he absolutely loves the surface. They have been working on his crossfiring with chiropractic work, and that is the main concern; whether he’s going to pull what he did in the Louisiana Derby. If he doesn’t and gets his leads correct, he should run a huge race. As I mentioned he is the only horse to earn a negative Thoro-Graph figure on the dirt, and he has the highest late-closing figures on Brisnet. So he has a lot going for him. He gets John Velazquez, and while he and Pletcher have both won Derbys, it would be special to them to win one together. Finally, of the serious horses, you have to include Wicked Strong, and I would really love to see Jimmy Jerkens win this, not only for himself, but his father, Hall of Fame legend Allen Jerkens. He has to negotiate a trip from the 19 post, and he can’t run as erratically down the stretch as he has in the past. But he does have the closing punch and as I have mentioned, he was going to be my first No. 1 ranked horse on the Derby Dozen in January, but ran a clunker in the Holy Bull, and that still bothers me a little, as does his past antics at the gate. But he is now where I thought he would be in January. He just has to handle the loading, get a trip from post 19, and run straight in the stretch, and use his closing punch earlier than the sixteenth pole. I did love the fact that had a strong three-furlong blowout in :36 3/5 May 1. It’s good to see Jimmy and Allen still keep those old-fashioned methods of training alive. As for horses like Samraat, Vinceremos, Tapiture, Chitu, Vicar’s in Trouble Wildcat Red, and Commanding Curve, they are all good horses and have a legitimate shot to at least hit the board on their best day. But in a race this wide open you have to narrow it down to a half dozen or so to play around with. As I mentioned earlier, I have to stick with California Chrome, because I still feel he is enormously gifted and could be on a different level than these other horses, but there are some minor concerns and he is not going to present any value, so while you have to use him in exotics, I don’t play favorites in the Derby and have to look elsewhere when it comes to straight win bets, even though he has the potential to break this race wide open if he gets a good trip and handles all the distractions. I’ve spoken to a lot of people who will play against him and feel he is vulnerable. Intense Holiday and Danza are two others that have to be include in all bets, with Danza also having the potential to be something special, especially if California Chrome has a bad day. Throw in Medal Count, Candy Boy, and General a Rod and you have my six-horse trifecta or superfecta box. I would also put California Chrome, Danza, and Intense Holiday on top and use them with the above-mentioned horses as well as Wicked Strong and Ride on Curlin, Again, if I have to leave anyone out it has to be the horses I haven’t seen work over the track, such as Samraat and Dance With Fate, both of whom would have a shot if they handle the track. The only one of those I have to include obviously is California Chrome, because, well, he’s California Chrome. And as I said, there are some slight concerns for those who want to play against him. I also will be making straight win bets on Medal Count (who is touting himself in the mornings), General a Rod, and Candy Boy, assuming they are going to be a big price. I love forgotten horses, and Candy Boy and General a Rod will be forgotten horses in my opinion, with Candy Boy coming into the race sneakily good and under the radar…and with Gary Stevens aboard. I also have to put a few bucks as a saver on Ride On Curlin if he’s a big price. So, the bottom line is that I am sticking with California Chrome (if he behaves), but love Danza and Intense Holiday to run huge races as the two morning standouts. Price-wise on win bets, based on proven dirt form and how they’ve handled the track in works and gallops, I’ll go with Candy Boy and Intense Holiday. ** Saturday morning late observations. Having looked at Tapiture schooling the other day and seeing him walk under tack this morning, I have to say how impressed I am with this colt from a physical standpoint. He seems to have really filled out and is packing good muscle and flesh. How that will apply to today's race, who knows, but Steve Asmussen has this colt looking fantastic.. I believe the Arkansas races took a lot out of him and he has flourished since coming to Churchill Downs. If he returns to his earlier form, he could surprise. That's just a late observation, for what it's worth. (Sorry, no photos today. I actually am now in Lexington and wasn’t even at Churchill Downs this morning, so hopefully, I didn’t miss anything of note. The track was scheduled to close at 7 a.m. for Oaks Day. I plan on making the most of my stay in Lexington by visiting Gainesway and Claiborne Farm today and having features in the near future on a look back at Afleet Alex’s Preakness and (speaking of forgotten horses) Blame, so watch out for those).